This chapter discusses how environmental lifestyles are covered in newspapers and their weekend supplements. It initially discusses the historical and cultural contexts of newspaper supplements. 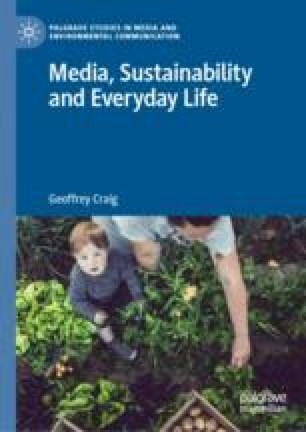 The chapter then highlights how everyday environmental practices are incorporated into general environmental news stories in UK newspapers, and finds that quality, conservative newspapers provide the greatest and most negative coverage of environmental lifestyles. The study also examines the frequency of coverage of different environmental themes and the accessing of different source groups. The chapter then examines the weekend colour supplements of UK newspapers, showing how the desirable promotion of environmental change nonetheless often posits an ethical consumer who is cognitively deficient, worried about the environmental consequences of their everyday lifestyles, and concerned about their ability to bring about environmental change. Boggan, Steve. 2013. “Waste Not, Want Not: Britain Has Become Nation of Recyclers—But Is It Making a Difference?” The Independent, May 11. http://www.independent.co.uk/environment/green-living/waste-not-want-not-britain-has-become-a-nation-of-recyclers–but-is-it-making-a-difference-8607804.html. Cooper, Charlie. 2011. “The Night I Ate Out … of a Bin.” The Independent, October 15. https://www.independent.co.uk/environment/green-living/the-night-i-ate-outof-a-bin-2370923.html. Lonsdale, Sarah. 2012a. “Green Living: Eco-renovating a Period Property.” The Telegraph, July 10. http://www.telegraph.co.uk/property/greenproperty/9389621/Green-living-eco-renovating-a-period-property.html. Lonsdale, Sarah. 2012b. “Eco Living: Trying Out the Green Deal.” The Telegraph, July 5. http://www.telegraph.co.uk/property/greenproperty/9378560/Eco-living-trying-out-the-Green-Deal.html. Lonsdale, Sarah. 2012c. “Green Living: The ‘Eco-clicktivists’.” The Telegraph, May 23. http://www.telegraph.co.uk/property/9284525/Green-living-the-eco-clicktivists.html. Lonsdale, Sarah. 2013. “Eco-living: Working Together for a More Sustainable World.” The Telegraph, April 30. http://www.telegraph.co.uk/property/greenproperty/10025301/Eco-living-working-together-for-a-more-sustainable-world.html. Renton, Alex. 2014. “How Climate Change Will Wipe Out Coffee Crops—And Farmers.” The Guardian, March 30. http://www.theguardian.com/environment/2014/mar/30/latin-america-climate-change-coffee-crops-rust-fungus-threat-hemileaia-vastatrix. Siegle, Lucy. 2012a. “Ethical Living: How Can I Become More Self-Sufficient?” The Guardian, August 12. http://www.guardian.co.uk/environment/2012/aug/12/ethical-living-lucy-siegle-self-sufficient-home. Siegle, Lucy. 2012b. “Ethical Living: Should I Swap My Bank?” The Guardian, July 29. http://www.guardian.co.uk/environment/2012/jul/29/lucy-siegle-ethical-living-banking. Siegle, Lucy. 2012c. “Ethical Living: It Is Right to Give a Dam?” The Guardian, July 22. http://www.guardian.co.uk/environment/2012/jul/22/lucy-siegle-belo-monte-dam. Siegle, Lucy. 2012d. “Ethical Living: Is It OK to Buy from Pound Shops?” The Guardian, July 15. http://www.guardian.co.uk/environment/2012/jul/15/lucy-siegle-pound-shops-discount. Siegle, Lucy. 2017a. “The Eco Guide to Electric Vehicle Hype.” The Guardian, August 20. https://www.theguardian.com/environment/2017/aug/20/the-eco-guide-to-electric-vehicle-hype. Siegle, Lucy. 2017b. “The Eco Guide to Cleaning Products.” The Guardian, September 24. https://www.theguardian.com/environment/2017/sep/24/the-eco-guide-to-cleaning-products. Siegle, Lucy. 2017c. “The Eco Guide to Christmas Trees.” The Guardian, December 10. https://www.theguardian.com/environment/2017/dec/10/the-eco-guide-to-christmas-trees. Siegle, Lucy. 2017d. “The Eco Guide to Using Your Money.” The Guardian, November 11. https://www.theguardian.com/environment/2017/nov/11/the-eco-guide-to-using-your-money. Siegle, Lucy. 2017e. “The Eco Guide to Big Ethics.” The Guardian, November 5. https://www.theguardian.com/environment/2017/nov/05/the-eco-guide-to-big-ethics. Siegle, Lucy. 2017f. “The Eco Guide to the Cod Bounceback.” The Guardian, November 19. https://www.theguardian.com/environment/2017/nov/19/the-eco-guide-to-the-cod-bounceback. Siegle, Lucy. 2017g. “The Eco Guide to Zero Wasters.” The Guardian, August 27. https://www.theguardian.com/environment/2017/aug/27/the-eco-guide-to-zero-wasters. Siegle, Lucy. 2017h. “The Eco Guide to Not Buying Stuff.” The Guardian, December 17. https://www.theguardian.com/environment/2017/dec/17/the-eco-guide-to-not-buying-stuff. Siegle, Lucy. 2017i. “The Eco Guide to New Mindful Activism.” The Guardian, October 22. https://www.theguardian.com/environment/2017/oct/22/the-eco-guide-to-the-new-mindful-activism. Topham, Gwyn, and Kim Willsher. 2014. “Tycoon Vincent Bolloré to Back London Electric Car Hire Scheme.” The Guardian, March 12. http://www.theguardian.com/uk-news/2014/mar/12/vincent-bollore-london-electric-car-hire-scheme.